(NX 2223 7166) Standing Stones (NR). The sculptured stone at Pultadie is built into the front of a new shed. Two cross-marked standing stones, of grey Silurian sandstone, traditionally said to be the survivors of a group of fourteen, seven of which remained in situ in 1873. They stand 2ft apart, facing west, the more northerly being 6ft 2ins high, 2ft 2ins broad and circa 1ft thick and the other 5ft 2ins high, 2ft 2ins broad and 8ins thick. Each bears on its west face the incised outline of an expanded-arm Latin cross 2ft to 3ft high with incised crosslets in the angles. A small squarish pillar 45ft to the east is said to mark the grave of a farmer who removed some of the stones. Wilson records as coming from this site two stones, one of them cross-marked, used as gate-posts at Pultadie (NX 182 700), two similarly used at Kilgallioch (NX 228 718) and the three used as lintels at Laggangarn (NX 220 714). What may have been one of the last, slab 34 ins long and 8ins broad, bearing at one end a simple Latin cross, 12 1/2ins long, lay against the wall on the outside of the old garden at the ruins of Laggangarn in 1911. Ground inspection in 1873 suggested to Wilson that there had been two circles, the remaining stones having been the most westerly, but he knew of no tradition to this effect. G Wilson 1875; RCAHMS 1912, visited 1911. Two standing stones as described in the previous information and a smaller stone 14.0m to their E presumably marking the farmer's grave. The standing stones are situated on the western extremity of a low knoll; there is no trace of other standing stones. 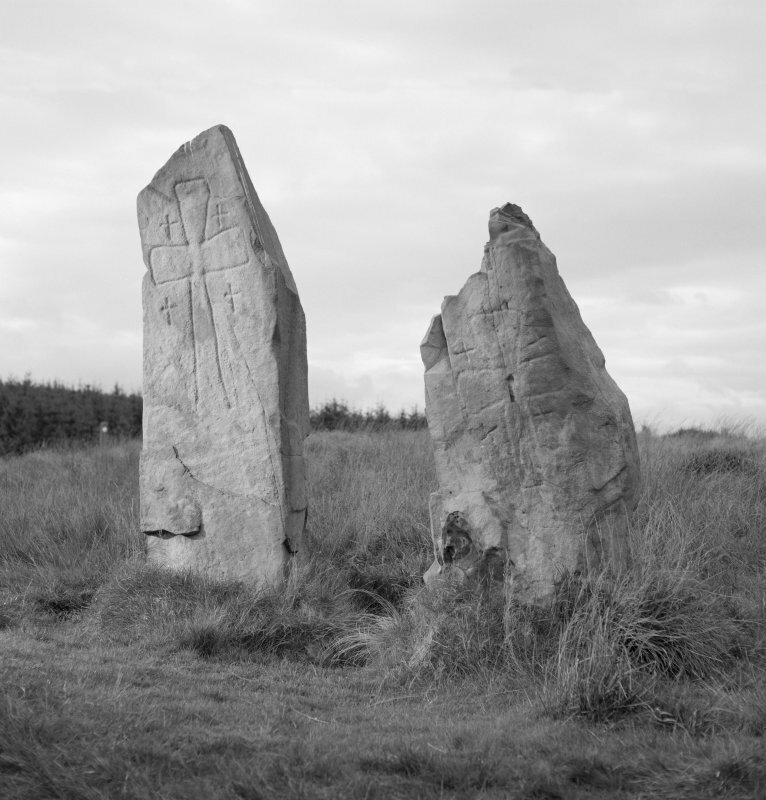 There is no knowledge of the two stones at Pultadie, nor is there any sign of the stones at Killgallioch. Several lintels are to be seen amongst the ruins of Laggangarn but that described by Wilson could not be recognised. This site has recently come under the guardianship of the Inspectorate of Ancient Monuments. A plaque at the site records that the two stones are Early Christian monuments of circa 8th century date which mark a now deserted settlement. There is no evidence of a deserted settlement here and it seems likely that the two stones are the survivors of a stone circle some of the stones of which were later inscribed with Early Christian crosses. (Analysis of the site and bibliography). Lonely sentinels over a remote moorland, this closely spaced pair of rough slabs now serves as a prominent landmark for travellers on the Southern Upland Way. Standing erect to heights of 1.88m and 1.58m, they each bear on the western face an incised Latin cross with tapered arms and, within the angles, four small crosses formed of intersecting lines. The larger crosses are of a style ascribable to the 7th-9th century AD, but the stones on which these Christian memorials have been carved are almost certainly of prehistoric origin. Tradition asserts that there were once thirteen stones in the group, but just how many there may have been and whether they ever formed a circle has not been convincingly demonstrated.